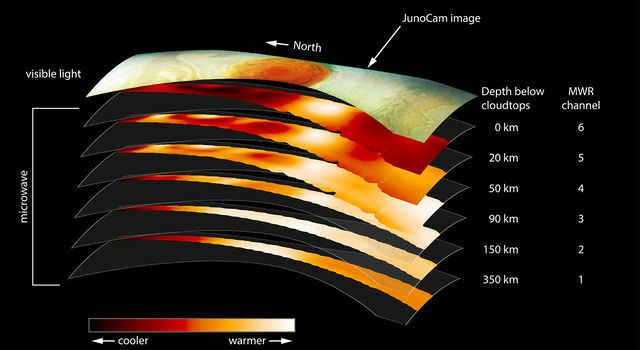 Raumfahrt+Astronomie-Blog von CENAP - Blog: Astronomie - How Deep Does Jupiter’s Great Red Spot Go? NASA’s Juno spacecraft peeked under the clouds of the most iconic weather feature in the solar system, Jupiter’s Great Red Spot, revealing a complex structure deep below the surface. NASA’s Juno spacecraft has been orbiting Jupiter for roughly a year and a half and has already provided us with many stunning views of the giant planet. But now NASA has revealed an unprecedented view of what’s below the clouds of one of its most distinctive features: the Great Red Spot. This animation depicts winds circulating in Jupiter's Great Red Spot. Citizen scientists Gerald Eichstädt and Justin Cowart turned JunoCam data into a color-image mosaic. Then Juno scientists Shawn Ewald and Andrew Ingersoll applied velocity data from a wind model to produce this looping animation. In June 2017 Juno took the best pictures of the swirling storm to date from a distance of just 9,000 kilometers (5,600 miles). During that pass, Juno’s microwave radiometer (MWR) recorded temperature changes deep below the surface of Jupiter’s long-lasting storm. Juno co-investigator Andy Ingersoll (Caltech) displayed the results at the meeting of the American Geophysical Union in New Orleans. The layers in this image show microwave measurements from six channels, which correspond to six wavelengths that sample different altitudes in the atmosphere. White marks warmer areas, while darker red colors mark cooler regions. The topmost layer shows JunoCam's visible-light image for reference. Although this is the deepest any instrument has ever probed, the Red Spot’s roots are still buried beyond the 200-mile detection range of Juno’s microwave radiometer. Juno has made some other surprising discoveries during its eight Jupiter flybys (the next one will occur on December 16th). During its sixth science orbit, Juno passed only 2,200 miles from the equatorial zone’s upper atmosphere, There, the Jupiter Energetic Particle Detector Instrument (JEDI) detected hydrogen, oxygen, and sulfur ions moving at almost the speed of light — markers of a new radiation zone surrounding the planet. Researchers think this radiation originates in gas around the moons Io and Europa. Energetic neutral atoms from this gas hit Jupiter’s upper atmosphere, which strips away electrons and turns the particles into high-energy ions. This graphic depicts a newly discovered radiation zone (blue glow above planet's equator) that surrounds Jupiter above the equatorial zone. The zone is located inside Jupiter’s previously known radiation belts (lines). At higher latitudes, Juno’s Stellar Reference Unit (SRU-1) found a different population of heavy ions within Jupiter’s already-known radiation belts. The belts contain mostly electrons streaming around the planet at close to the speed of light. Yet somehow heavy, high-energy ions are finding their way into the belts too. 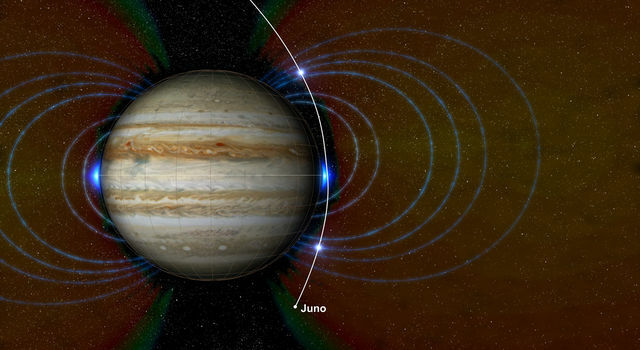 “We knew we'd see lots of relativistic electrons in the high latitudes but the high energy ions were a surprise," says Heidi Becker (NASA/JPL), who leads Juno’s radiation monitoring investigation. The find itself is mysterious, as the SRU-1 is a navigation system that’s heavily shielded against radiation. Yet these particles manage to reach the detector inside the unit, where they appear as bright white spots in the detector's output. Juno has just completed the first quarter of its science mission, which calls for 32 orbits around Jupiter. Juno's principal investigator, Scott Bolton (Southwest Research Institute), says the spacecraft systems appear to be in good shape, but he warns that the second half of the mission will be more technically demanding for the spacecraft. Data collected by NASA's Juno spacecraft during its first pass over Jupiter's Great Red Spot in July 2017 indicate that this iconic feature penetrates well below the clouds. Other revelations from the mission include that Jupiter has two previously uncharted radiation zones. The findings were announced Monday at the annual American Geophysical Union meeting in New Orleans. "One of the most basic questions about Jupiter's Great Red Spot is: how deep are the roots?" said Scott Bolton, Juno's principal investigator from the Southwest Research Institute in San Antonio. "Juno data indicate that the solar system's most famous storm is almost one-and-a-half Earths wide, and has roots that penetrate about 200 miles (300 kilometers) into the planet's atmosphere." This animation takes the viewer on a simulated flight into, and then out of, Jupiter's upper atmosphere at the location of the Great Red Spot. It was created by combining an image from the JunoCam imager on NASA's Juno spacecraft with a computer-generated animation. The science instrument responsible for this in-depth revelation was Juno's Microwave Radiometer (MWR). 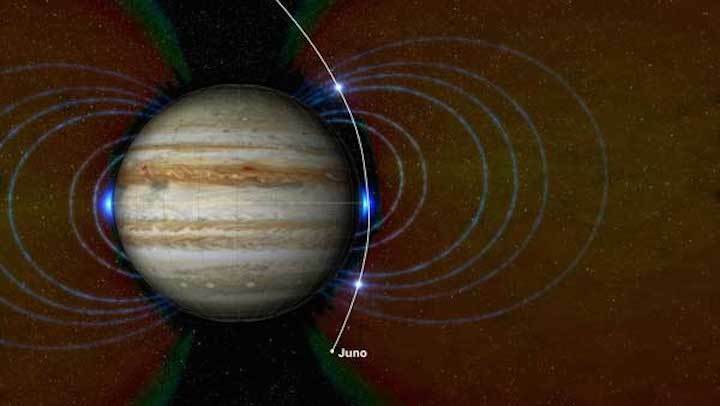 "Juno's Microwave Radiometer has the unique capability to peer deep below Jupiter's clouds," said Michael Janssen, Juno co-investigator from NASA's Jet Propulsion Laboratory in Pasadena, California. "It is proving to be an excellent instrument to help us get to the bottom of what makes the Great Red Spot so great." Jupiter's Great Red Spot is a giant oval of crimson-colored clouds in Jupiter's southern hemisphere that race counterclockwise around the oval's perimeter with wind speeds greater than any storm on Earth. Measuring 10,000 miles (16,000 kilometers) in width as of April 3, 2017, the Great Red Spot is 1.3 times as wide as Earth. "Juno found that the Great Red Spot's roots go 50 to 100 times deeper than Earth's oceans and are warmer at the base than they are at the top," said Andy Ingersoll, professor of planetary science at Caltech and a Juno co-investigator. "Winds are associated with differences in temperature, and the warmth of the spot's base explains the ferocious winds we see at the top of the atmosphere." The future of the Great Red Spot is still very much up for debate. While the storm has been monitored since 1830, it has possibly existed for more than 350 years. In the 19th century, the Great Red Spot was well over two Earths wide. But in modern times, the Great Red Spot appears to be diminishing in size, as measured by Earth-based telescopes and spacecraft. At the time NASA's Voyagers 1 and 2 sped by Jupiter on their way to Saturn and beyond, in 1979, the Great Red Spot was twice Earth's diameter. Today, measurements by Earth-based telescopes indicate the oval that Juno flew over has diminished in width by one-third and height by one-eighth since Voyager times. Juno also has detected a new radiation zone, just above the gas giant's atmosphere, near the equator. The zone includes energetic hydrogen, oxygen and sulfur ions moving at almost light speed. "The closer you get to Jupiter, the weirder it gets," said Heidi Becker, Juno's radiation monitoring investigation lead at JPL. "We knew the radiation would probably surprise us, but we didn't think we'd find a new radiation zone that close to the planet. We only found it because Juno's unique orbit around Jupiter allows it to get really close to the cloud tops during science collection flybys, and we literally flew through it." Juno also found signatures of a high-energy heavy ion population within the inner edges of Jupiter's relativistic electron radiation belt -- a region dominated by electrons moving close to the speed of light. The signatures are observed during Juno's high-latitude encounters with the electron belt, in regions never explored by prior spacecraft. The origin and exact species of these particles is not yet understood. Juno's Stellar Reference Unit (SRU-1) star camera detects the signatures of this population as extremely high noise signatures in images collected by the mission's radiation monitoring investigation. To date, Juno has completed eight science passes over Jupiter. Juno's ninth science pass will be on Dec. 16.